Nokia C2-00 vs. Nokia X1-01 : How Are They Different from Each Other? Which Dual SIM Phone to Choose? "Hi TP! I just saw Vic Sotto give a demo of both Nokia C2-00 and Nokia X1-01 on Eat Bulaga. I understand both of these are budget Dual SIM handsets but Nokia C2-00 is a bit more expensive. [I'm just wondering how they are different from each other. Please enlighten me on this. I'm a Nokia fan and I'm having a hard time time choosing between the two.] I'll definitely buy one of them soon though. Thanks!" 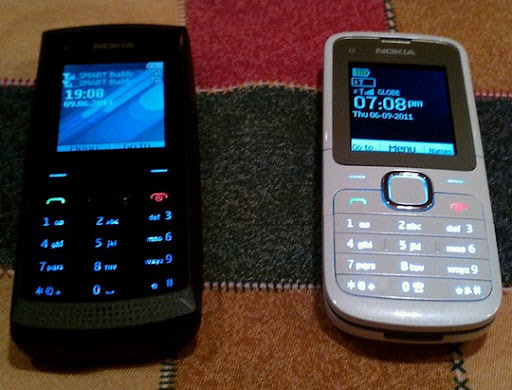 Nokia X1-01 and Nokia C2-00, respectively. Nokia X1-01 costs only Php 1,990 while Nokia C2-00 sells for Php 2,990 -- both very affordable! Hi Christine! Thanks for the email. We appreciate it. Nokia C2-00 and Nokia X1-01 are alike in the sense that they are both dual SIM dual Standby phones, both come with an alphanumeric keypad, and that they have largely similar user interface -- albeit Nokia X1-01 runs on S30 platform while Nokia C2-00 runs S40. But how are they different from each other? 1. Nokia X1-01 has a more boxy form factor compared to Nokia C2-00's rounder design. 2. Nokia X1-01 is wider, thicker and heavier than Nokia C2-00; Nokia X1-01 has dimensions of 112.2 x 47.3 x 16 mm and weighs 91.1 grams while Nokia C2-00 measures 108 x 45 x 14.7 mm and weighs only 74 grams. 3. Nokia C2-00 has an Easy Swap port, which makes it convenient to change SIM cards without having to remove the battery or turn off the phone. This is the main selling point of Nokia C2-00 vs. other dual SIM phones, in my opinion. Watch a demo of Nokia C2-00 Easy Swap via the link. 5. Nokia C2-00's microSD card slot supports up to 32GB while that of Nokia X1-01 only supports up to 16GB. So which budget Nokia dual SIM phone should you choose? If you're a music lover and you want to always have a loud speaker for your tracks wherever you go, I'd suggest you go for Nokia X1-01. If you use more than 2 SIM cards and you want to experience the convenience of using Easy Swap, get Nokia C2-00. There you go, Christine. I hope you find this helpful. walang easy swap ang Nokia X1-01? Thanks for this! It will really help me to decide which model to buy. for me.. i like Nokia X1-01 because it costs only Php 1,990 .. for my basic phone.. I like the X1-01 more but I've read it's in Symbian S30. How does it fare compared to C2-00 being an S40 phone? Does it lag or is it slower in terms of being responsive? i have nokia c2-00 as my secondary phone. it can't save messages on the memory card but it can store a lot of sms messages compared to samsung duo which has limits on storage. you can customize the phone to your taste. you can also send sms directly compared to samsung duo which you have to switch to the other network. I have a C2-00 and I find it favorable it over the X1-01. My initial intent was to have a dual sim phone that can be a music player at the same time and won't make me feel bad if ever worse comes to worse (e.g. hold ups or getting it misplaced). C2 makes it for me because it has Playlist making and it supports Bluetooth (so that you can hook up a bluetooth headset!). And the phone is real fast! I'm not expecting this from a 3k dual sim phone after my disastrous encounter with a Cherry Mobile unit of the same price range. What I was a bit nitpicky about the C2 was that you cannot make contact groups on the 2nd sim slot (e.g. the Easy Swap Slot)... and I was thinking it would've been handy for when that hold up scenario comes in. While the c2-00 has a VGA camera, it is NOT the tipping point for getting one, I'd say it's more of the BT, 32GB support, and the easy swap port that has people swaying for this one rather than the X1-01. 1k diff for those is not much to ask for those. X1-01 has a flashlight function too :) which I hoped the c2-00 had. Does the C2-00 have the mark/mark all feature? The X1-01 does not have it. I bought the X1-01 back when it was first released (June 17). I'm pretty impressed. I'm satisfied. :) Since buying it, I've only charged the phone twice. The battery life's looooong. Really good in performing (sms, calls, mp3 music and radio). I love the speaker's performance. It didn't matter to me whether it's not stereo. I've plugged in my Shure SE530 earphones and the sound was great! Comparable to my iPod's sound output (I'm using an 8GB microsdhc filled with 128kbps mp3 files), the music was loud and clear. My only complaint was that it can only support 100 songs in just 1 (favorite) playlist (but that's ok anyway). Above all, the dual-sim capability is the stand-out feature of this phone. I have my Smart sim in my X6-00 while my Sun and Globe numbers are housed in the X1-01 (perfect for Unli text and calls). A good buy indeed! Does the Nokia C2-00 has a radio also? does x1-01 and c2-00 has bluetooth?